During the last two days, there have been rumors that Zimbabwe’s leader Robert Mugabe fights for his life in a Singapore hospital. Meanwhile, Zimbabwean officials dismissed such media reports. Media reports had been reporting today and yesterday that Mugabe was currently fighting for his life in a Singapore hospital. Originally he flew to Singapore to oversee the enrollment of his daughter in a postgraduate course at Singapore University. After Wikileaks revealed that Mugabe was ill with prostate cancer, there had been several rumors about Mugabe’s state of health. Indeed a cabinet meeting that was originally scheduled for today, had been moved to Thursday. Mugabe usually chairs these meetings. Lies meant to destabilize Zimbabwe. Some sick and malicious people are spreading false stories about him being seriously ill while others are saying he is dead or dying out there. 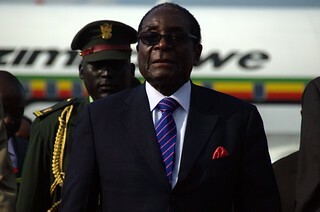 Observers currently fear that in case of Mugabe’s death in office, the country will be shaken by a political meltdown. The party could erupt in internal conflicts and with that destabilize the whole country even more. Further fear arose that defense chief Emmerson Mnangagwa, former head of Zimbabwean Central Intelligence Organisation and Mugabe’s campaign manager during the elections in 2008 could take over Mugabe’s position in case of his death. Mnangawa is seen as the responsible actor for the violent clashes in the aftermath of the elections. At this time, it can only be speculated how the political landscape in Zimbabwe will develop and it needs to be seen how Mugabe’s real state of health turns out to be.